It is well documented that rear-facing seats are safer in the event of a crash – they not only offer more support for the head and neck, but also, because of the way the body is thrown back against the seat, they reduce the likelihood of injuries caused by the seat belt. The evidence is so compelling that more than 20 US states have introduced new legislation making it mandatory for all children aged under 2 to travel in rear-facing car seats. It doesn’t matter if you’re in charge of coaches, taxis, mini-buses, ambulances or any vehicle used by members of the public, the safety of your passengers is paramount. Currently, standard seating is designed for adults, but safety regulations regarding the transport of small children are getting tighter all the time. There is, therefore, an increasing need for an easy and practical alternative to installing ISOFIX bars and carrying around child seats – one that doesn’t use so much space. That is why we developed and patented the ingenious SitSafe convertible adult/child seat for coaches, mini-buses and other public vehicles. Designed for children between the ages of 1 and 4, it provides a more convenient and permanent solution to the problem. How does a SitSafe seat work? The SitSafe seat looks like any other adult seat you would see on a bus or coach etc. If you are transporting adults, they won’t even notice there’s anything special about it. That’s because the child seat is integrated into the back of the chair. 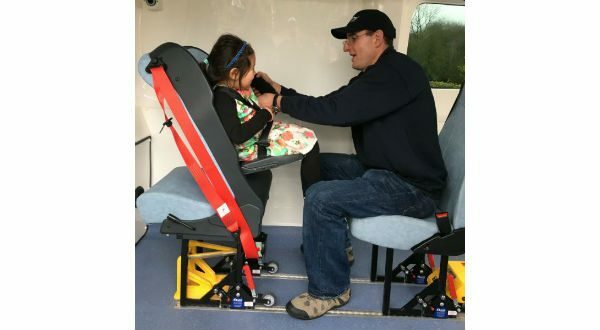 When it is needed, all you have to do is pull a lever and the back of the chair moves forward to allow the child seat to fold down so the child can sit on it, facing the adult sitting on the seat behind, at eye level. Click here to see how it works. We can customise the SitSafe with your company’s preferred fabric in order to stay on brand. It is a straightforward process to retrofit our seats, so you can incorporate them into your fleet whenever you would like. The SitSafe has already been integrated into many transport fleets in Scandinavia and, in the UK, has been installed in vehicles operated by Great Ormond Street Hospital. If you would like to incorporate SitSafe seats into your passenger transport fleet, contact us to find out more.